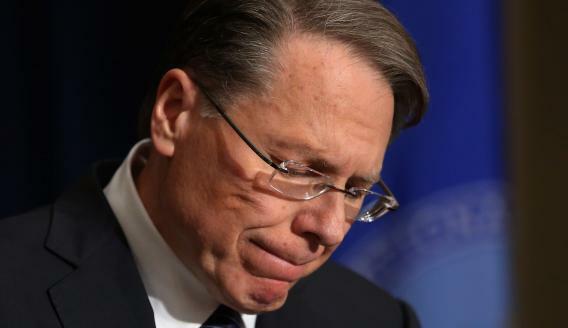 NRA's Wayne LaPierre Press Conference: Gun group breaks silence in wake of Newtown shooting. NRA executive vice president Wayne LaPierre called on Congress to pass a law putting armed guards in every U.S.
Read more on Slate about gun control. The National Rifle Association broke its week-long silence this morning to call on lawmakers to offer an armed guard to every school in America to prevent tragic school shootings like the one that killed 26 people in Newtown last week. The proposal appears designed to appeal to the pro-gun lobby’s base, and not to the growing number of lawmakers who have suggested their openness to more gun control, likely beginning with additional restrictions on assault weapons. LaPierre waited until roughly 20 minutes into his press conference to unveil his school-guard proposal, dubbed the “National School Shield” program. Before he got to it, however, he cast blame on “blood-soaked films” and “vicious, violent video games” for poisoning our culture, and on lawmakers behind gun-free school zones and the “national media machine” for demonizing firearms and putting the nation’s children at risk. During his remarks, which lasted roughly half an hour, he was interrupted twice by protesters—likely from Code Pink—who managed to sneak into the event. The first held up a sign that read “NRA KILLING OUR KIDS.” LaPierre initially continued speaking but later paused while security escorted the protester out of the room. “Because for all the noise and anger directed at us over the past week, no one, nobody has addressed the most important, pressing and immediate question we face: How do we protect our children right now, starting today, in a way that we know works?” LaPiere said in a not-so-veiled bid to push back at President Obama’s promise to send specific proposals to Congress next month. The press conference comes one week after the Newtown shooting and three days after the gun lobby released a short statement promising to offer “meaningful contributions” to help ensure that what happened in Connecticut “never happens again.” Both LaPierre and NRA president David Keene are scheduled to appear on Sunday’s D.C. talk shows. Slate will have plenty more on the NRA and its proposal shortly. In the meantime, you can read LaPierre’s full remarks here, or view a snippet below. This post was updated at 11:57 a.m. with additional information and analysis.